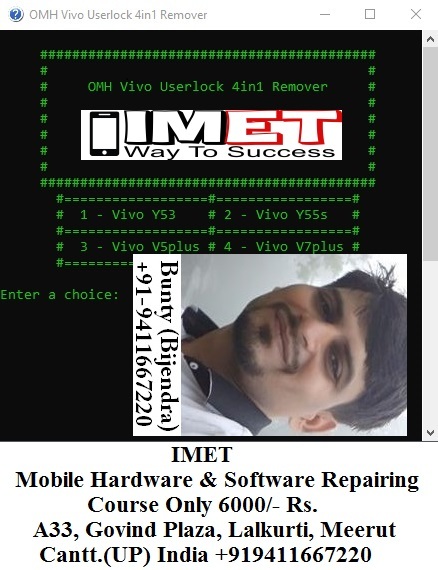 OMH Vivo Userlock 4in1 Remover Tool is a small application for Windows computer, it allows you to Unlock the user-lock from Vivo Y53, Vivo Y55s, Vivo V5 Plus, Vivo V7 Plus, This Tool Developed by OMH MIN HTET it’s Free to Download and fully activated, and very easy to use, OMH Vivo Userlock 4in1 Remover Tool Its latest version is released and available for direct download from our website. If you are interested in download the latest OMH Vivo Userlock 4in1 Remover Tool than simply follow the link given at the bottom. It is free to download and very easy to use. So download and enjoy the new OMH Vivo Userlock 4in1 Remover Tool on your PC. How To Use OMH Vivo Userlock 4in1 Remover Tool ?